Other examples of work by Miss C. Smith can also be found at the University of Massachusetts Center for Lowell History; contact them for more information on how to view them. On today’s episode we’re going to track down the true identity of one Miss C. Smith from Lowell, Massachusetts. For more information about any of the women discussed in today’s episode, visit my website at p3photographers.net. That’s letter “p”, number “3”, photographers “dot” net. Today we start with photos from the 1800s. 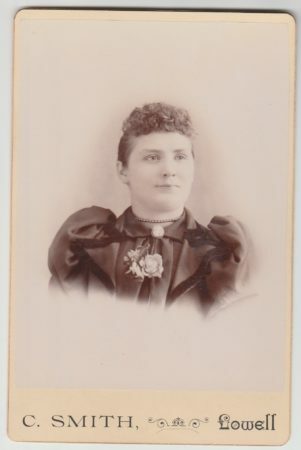 They are cabinet cards and some carte de visites, the smaller format ones, where the photographer is identified only as Miss C. Smith — that’s just the initial “C” for the first name. Answering that question turns out to be fairly easy because there are city directories from Lowell, Massachusetts for the late 1800s. And in those we can clearly see that Miss C. Smith who was running a photography studio there was one Miss Costillia Smith. 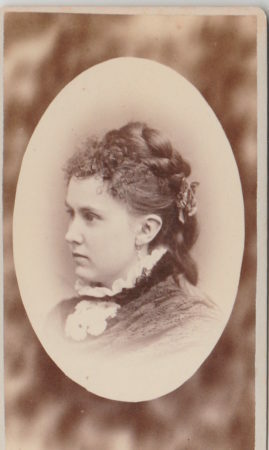 She was running a photography studio in Lowell, Massachusetts as early as 1877. She was incredibly successful, since she runs the studio in Lowell, at a series of different locations — and for a time even has two locations simultaneously — over a 30 year period. Now, there’s an obituary in the Lowell newspaper that says that when she dies in 1905 — at the age of 75 — she’s been running her studio for 30 years. OK, so the answer to the basic question, “Who is Miss C. Smith from Lowell, Massachusetts?”, is that she was Miss Costillia Smith. OK, so, I do think that’s the right answer. But the fun in doing this kind of research is to piece together more details about the photographer and her life. In Miss Costillia Smith’s case, we’re going to try to uncover details to bring her story more into focus in terms of who she was and how she lived. Except, as we’ll find, as we dive into some of these details, that instead of bringing her story into focus, well it becomes a little bit more cloudy. For example, let’s start by looking at some details from the census records — that’s usually a very handy spot to start. In Lowell, Massachusetts, we have the advantage that we have the city directories as a counter example in-between the censuses, so that we are not dependent just on the US census, which was every ten years on the even years, e.g. 1850, 1860, 1870, 1880, etc. The city directories [can] fill in some of those gaps in the decades. 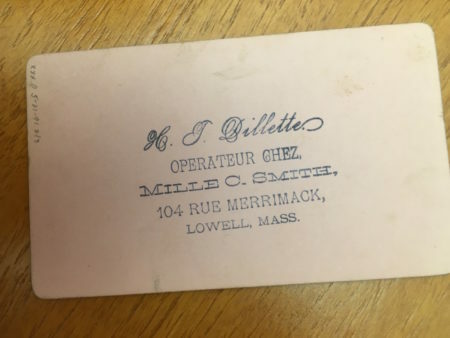 But in Miss Costillia Smith’s case, we can see from the directories in Lowell that she was a photographer starting in 1877, and, as I mentioned, she runs her studio for 30 years. Which means that she was a photographer in 1880. Which is great, because, I have a personal affinity for the 1880 census. Now, it’s a little bit strong to say that you have a favorite census, but in my case the 1880 census is great because when I first started doing this research, the great familysearch.org site, which has transcribed a lot of the census records and digitize them, so that you can search for people on them, and then view the original and the transcription there together, online, [for free], well, the 1880 had been coded early on so that you can actually search by occupation. Which is great when you’re doing a project on early women photographers, you can search to see who was listing themselves as a photographer in the 1880 census. So, I thought, OK, great — we know that Miss Costillia Smith was a photographer in 1880 in Lowell, so let’s go look at the census and see what other details we can find out from the census, like where she was born, where her parents were born, etc. …. no MIss Costillia Smith?! Now, again, in the 1880 Lowell city directory, she was listed as a photographer at 100 Merrimack Street. The directory says she’s living and working at 100 Merrimack Street. But not only is Costillia Smith not in the 1880 census, in fact there is no one listed at 100 Merrimack Street in Lowell, Massachusetts in the 1880 federal census. 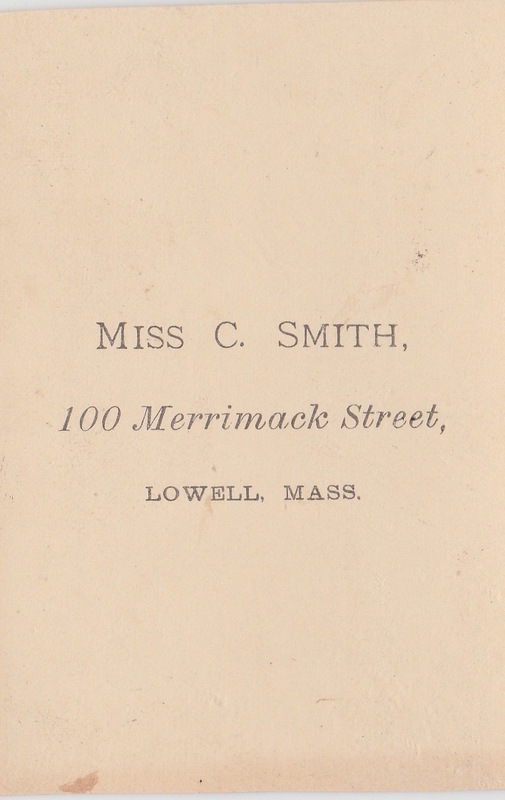 But … on the page where it should have been, it turns out that there is a photographer, a photographer named Catherine Smith, but it says that she lives and works at 112 Merrimack Street. 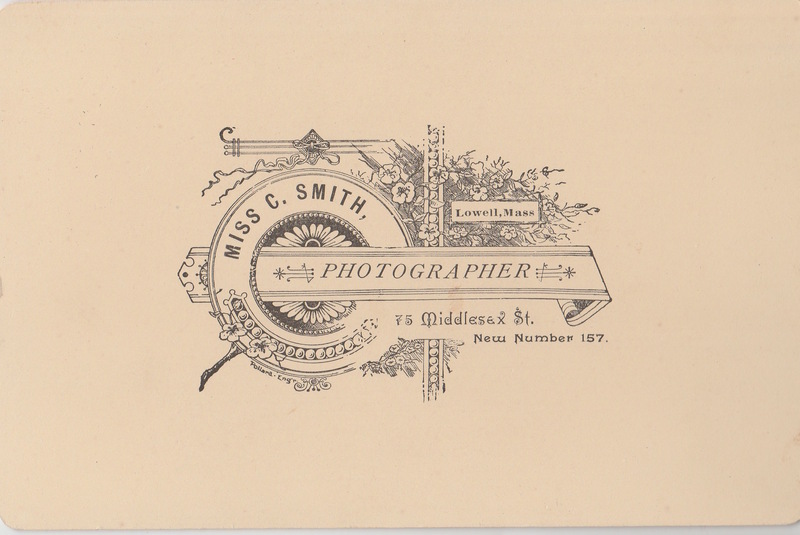 OK, so Catherine Smith was a photographer living and working at 112 Merrimack street in the 1880 census. So let’s go back to our Lowell city directory. And we look in the Lowell city directory, and is there is Catherine Smith at 112 Merrimack Street in the Lowell city directory. 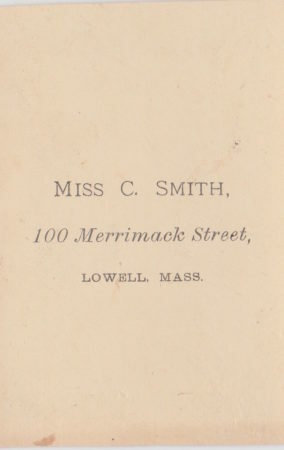 Furthermore, when we look in the Lowell city directory it turns out that there is a photographer at 112 Merrimack street, but it’s not Catherine Smith. It’s a woman named Miss M. Frank Kimball. She’s working at 112 Merrimack Street, running a photography studio there. But, when we go back to the census, we discover that there’s no record of Miss M. Frank Kimball in the 1880 Lowell city census. So, in the Lowell city directory for 1880, there are two women photographers operating studios on Merrimack Street. But she [Catherine Smith] is the only one who was a photographer who appears on Merrimack Street in the 1880 Lowell census. The only thing I can think of is that the person doing the census was jotting down notes as they were taking the census, and then they wrote up their notes on the page later. Totally wrong, really, for what we can see from the directories, but that’s what we were left with in the 1880 census for Lowell. It’s sounds kind of crazy to make all those leaps and think that’s what happened, but that’s the only way I can reconcile the varying information that we have from these two sources. Because usually you’re not gonna find two wildly different stories that you reconstruct from looking at the census and the city directories. So it turns out that 1880 is not the greatest census for us to get information about Costillia Smith. Now, it’s also not like tracking Costillia in the other census records over her lifetime is actually that easy, because her name is unusual, and we find it misspelled a number of ways, both in the hand-written census records, [and] also in the transcription that we can search it digitally. The first mention we find of Costillia Smith doing anything with photography is actually in 1870. She’s living in Lowell at that point and working in photography rooms, it says. A quick check back in the 1870 Lowell city directory shows us where she’s working: she’s working at the studio at 89 Merrimack Street. And so when we take a look in the city directory in the list of photographers — or actually in the list of “Photographists” as they were called that year — it turns out that Miss Smith is working for a photographer named Moses W. Emerson. So, see, sometimes the census records can be in sync with the city directory, because we do have the same information in the 1870 census and the 1870 city directory. And also, sometimes you can find some fun connections via the census when you look at everything together. So for example, I’m going back a little earlier in 1855, we find Miss Costillia Smith living in a boarding house in Lawrence, Massachusetts, a town that’s nearby Lowell. It’s hard to say what she was doing in Lawrence, Massachusetts in 1855, because unfortunately the censuses didn’t start to record women’s occupations until 1860. So we don’t know what she was doing [there]. Now we can see that there was another border in that same boarding house in 1855, a man named Moses W. Emerson. He’s a painter and … well, we’ll come back to him in a second. By 1860 Costillia is living in another boarding house in Lawrence, but that Moses Emerson is no longer in the building. But there are two women with the last name of Smith living there as well in 1860: a woman named Angie, and a woman named Emma. Costillia is not listed as having a particular occupation in 1860, but the two women, Angie Smith and Emma Smith are both listed as workers in the mill. Smith is a common name, but I’m pretty confident that Angie and Emma are actually Costillia’s sisters. Which seems like a good time to take a moment and say a little bit about what I think I found about Costillia’s family. In most of the census records, Costillia Smith’s birth place is listed as being in Maine. And both of her parents are listed as having been born in Maine as well. In fact, we look back into the old census records we find that there’s a James Smith who was a sea captain and a fisherman, who married a woman named Huldah Leland in August of 1831. By 1850 James and his wife Huldah are living in Maine raising a large family. They have many children — ultimately they’re going to wind up with 13, but in 1850 I think they only have 11. In that list in 1850, there’s a daughter named Angie and a daughter named Emma, and their ages are consistent with the Angie and Emma who are living in Lawrence in 1860. Now they are living with Costillia in 1860. But in 1850 Angie and Emma are living with their parents, James and Huldah – but there is no Casilla Smith in the listing in 1850. But by 1850, Costillia would have been old enough to have been out on her own. She was born in — well we’ll take it as being born in 1832 for right now, although we’re gonna come back to that in a moment — but if we say she was born in 1832, by 1850 she’s eighteen, and old enough to be out on her own, [maybe] working in the mill or doing something in Lawrence, Massachusetts on her own. It’s certainly the case that Emma Smith in 1860 is younger than 18 [when she’s in Lawrence working at the mill] so it’s certainly conceivable that there’s a reason why Costillia wouldn’t be living with James and Huldah in 1850 [in Maine]. But here’s one of those tricky things about the censuses. So, the censuses were taken at different times, over a certain period of time in the year that it’s taken, but it doesn’t have to be taken on a particular day. And in 1860, the census in Maine is taken early in June, and the census in Lawrence, Massachusetts is taken later in June. Which is why I think it is plausible that the 1860 census I found for James and Huldah and their children includes Angie and Emma and Costillia. But then, a little later that month, the census is taken in Lawrence, Massachusetts, and that census puts Costillia, Angie, and Emma all in Lawrence. Costillia would not be the first person I’ve seen listed twice in one year in two different censuses, indicating that they moved just in time to get counted again. And I think that’s what we’re seeing here. The next record we found is a marriage certificate in 1861, and it’s Angie Smith getting married to a man named John Emerson. Emerson — remember that name? Back in 1855, Costillia Smith was living in a boarding house in Lawrence. and another resident there, as I mentioned, was a man named Moses W. Emerson. In 1855 he was a painter … he later becomes a photographer, and it turns out that he has a brother named John Emerson. So … Angie, Costillia’s sister, marries John, the brother of Costillia’s friend of Moses. And later on, by 1870, Costillia wind up working for Moses in his photography studio in Lowell. I mean I don’t have anything solidly prove that Angie and Costillia were definitively sisters, but I think that the facts that I’ve uncovered really point to that being the case. So she brings them back to Lawrence, they get jobs in the mills, Angie then meets Costillia’s friend Moses, then meets Moses’ brother John, they fall in love, they get married, war breaks out … and what happens in the 1860s is actually kind of a mystery, but at some point after the war Moses becomes a photographer. He invites Costillia to come work for him. But then she winds up working for Moses for awhile, and then by the mid-1870s, she branches out on our own, so both of them are competitors, Costillia and Moses, running successful studios there in Lowell, Massachusetts. James and Huldah are buried together in Maine with three of their children: a son named Preston, and unfortunately both Angie and Emma, who died relatively young. Huldah, their mother, died in 1874, and she’s actually the last one of that family to be buried in that grave. So Angie, actually, by 1874, has died. John Emerson is still alive, but he dies soon after. But Angie and John, though, leave a son named Albert. Albert, of course, Costillia’s nephew. 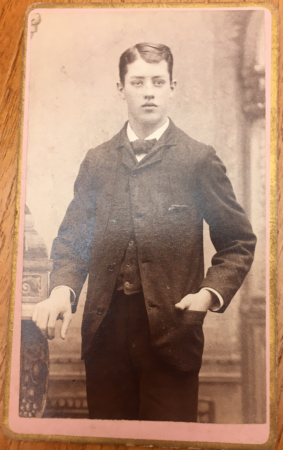 Now, he factors into Costillia’s story that we’re reconstructing today, even though there’s no evidence that he ever was a photographer. But he did settle in Lawrence as an adult, and as it turns out he’s actually buried in the same grave with Costillia, because he dies in 1908. But he’s alive in 1905 when Costillia dies and he’s actually the informant for the information that appears on her death certificate. Which leads me to some of the details from the death certificate that create yet another slight complication. As I’ve said, in just about all of the records that I’ve turned up in the census for Costillia, her birth location is most often recorded as being in Maine, and is most often [recorded] as being in Maine as the product of two parents from Maine. James Smith and Huldah Leland Smith were both born in Maine, and they’re the ones on the 1850 and 1860 censuses, that have the children that include Costillia, Angie and Emma. In all of the directories prior to the mid-1880s in Lowell, Massachusetts, the photographer’s name is just listed as “Miss Costillia Smith,” with no middle name. But starting around 1884, she starts to list herself in the directories as “Miss Costillia D. Smith”, or “Miss C. D. Smith”, with the letter “D” as a middle name. OK, so the first question, then, is what does that middle initial “D” stand for? Which brings us back to the death certificate, because her full name only shows up in one place that I’ve tracked down so far, and that’s on that death certificate. And on that death certificate it says her name is Costillia D’Lacost Smith. The middle name is spelled “D’Lacost”. It also says on the death certificate that her parents were James Smith who was born in Maine, and a mother named Hannah D’Lacost, who was born in France. So that’s different information than I found prior to 1900. Because in the censuses up to 1880, Costillia’s mother is always listed as having been born in Maine, like Huldah Leland. But now, on the death certificate, it says her mother was [instead] Hannah D’Lacost, who was born in France. And the idea of the mother being born in France is actually reflected on the 1900 census for Costillia Smith. So what’s interesting is to try to figure out what actually was going on, and what could have prompted the change of calling herself “Costillia Smith” to calling herself “Costillia D Smith” in the 1880s? Around that time, she actually hired of French speaking camera operator named Hormidas T. Dillette. She also at that time started listing her studio — in advertising and on the cabinet cards themselves — in both English and French. So, for example if she was on Merrimack Street, or Middlesex Street, it says instead “Rue” Middlesex or “Rue” Merrimack, using the French word “rue” for “street”. Her name on these cards is also not just Miss Smith, but Mademoiselle (Mlle) C. Smith. Now, there’s no census record from 1890, which might have helped confirm when exactly she started to say that her mother was French, and whether it was really at the moment when she discovered that her mother was Hannah D’Lacost, instead of Huldah Smith, that maybe at that point she started using that middle initial “D”. But unfortunately the federal U. S. census from 1890, of course, is the one that was lost in a fire. So we don’t have any records that show us what she was saying [in 1890] in the census for where her mother was born. Maybe she started using that middle initial “D” because she discovered sometime in the 1880s that in fact the woman who raised her, Huldah Smith, was not actually her birth mother, and that her birth mother was this woman named Hannah D’Lacost. Now if we look at that and we try to figure out if that could be true, it actually helps to explain some of the variability about her birth date. Because when we look at the census records, it would seem that her birth years are wildly different, since some of them posit that she was born as early as 1828, while some of them say she was born as late as 1832. I have run into other women who seem to lie about their age — not just women, but men as well — in the census records. But this is so widely different that it occurred to me that maybe when she was growing up, her birth date was said to be after James and Huldah’s marriage in 1831, which would explain the 1832 birthdate on some of the early [census] records. But maybe in fact she was a product of James and Hannah’s marriage before 1831, which would explain why maybe she was born earlier, like 1829/1830. That’s actually the birth date that we can reconstruct from the death certificate. Now, again, the romantic in me, when I ran across this information, I really wanted to find more evidence for this French woman named Hannah D’Lacost. I mean, there is potential there for some spectacular story, right? A sea captain from Maine sails to Europe, falls in love with a French woman, they marry, return to the US. She’s pregnant so they stop in Boston where she gives birth to little Costillia — and actually, according to the death certificate, Costilia was born in Boston, Massachusetts, not in Maine. OK, so Hannah gives birth, and then maybe Hannah tragically dies in childbirth or shortly thereafter. James returns with his daughter, Costillia, to Maine, and then falls in love with Huldah Leland, who becomes a mother to the little Costillia. Huldah and James marry in 1831 and have twelve more children their own. Costillia’s the oldest because, of course, she was born before their marriage. She heads off as soon as she’s old enough to make some money — in the mills in Lawrence? — to help support that large family back home in Maine. But then she ultimately she starts working as a photographer. And unfortunately James and Huldah are both dead by 1874. But something happens in the 1880s which uncovers Costillia’s true birth mother’s identity being Hannah D’Lacost. That prompts Costillia to want to reconnect with her French roots, so she adds the middle initial in tribute to her birth mother, and adds French to her business model for her studios. OK, well … a lot of that is just pure speculation. But, it is clear that Costillia did expand her business to attract a French speaking clientele in the 1880s. And she definitely did change her name to use Costillia D. Smith for the last 20 years of her professional life. But the rest of the details on that death certificate, including Costillia’s birth place being Boston instead of Maine; Costillia’s mother being Hannah instead of Huldah; well, none of that can actually be independently confirmed by any other source, it really only comes from that death certificate. And since I don’t know how much Albert Emerson, Costillia’s nephew, would really known about his roots, since he was being brought up in Massachusetts instead of Maine, and may or may not have known many of his aunts and uncles … well much of the information on that death certificate may have been provided by Costillia herself, and so we don’t know on what basis she was constructing that kind of history. So part of the fun of this project is to try to dig into the historical record to find out about the lives of these women photographers. Usually I have a number of materials and my disposal, and today I’ve pointed to the census, the Lowell city directories, marriage certificates for the parents and for the sister who got married. Other newspaper articles are kind of lacking, although there are some ads for Costillia’s studio in the Lowell newspapers later on. But there are frustrating gaps when we’re trying to reconstruct the history of Miss C. Smith: there’s no birth record, there’s actually no record other than the death certificate that really gives her full name with the middle name, and even pinpoints where she was supposed to have been born. And the directories don’t even start to use that middle initial “D” until after 1884. There’s nothing, of course, in the record that tells us why she changed her name or why she started to advertise her some of her studios in French. So, there’s not a lot of little bits and pieces to help us understand the daily life our photographer here. But what we can understand for certain today about Miss C. Smith is that MIss C. Smith owned and operated a very successful photography studio in Lowell, Massachusetts for 30 years. And Miss C. Smith was definitely one Costillia Smith — or, as she later called a self, Costillia D. Smith. I really want to thank the folks at the Center for Lowell history at the University of Massachusetts for helping sort through some of the records and photos by Miss C. Smith. Also, Peter Palmquist collected quite a few photos by Miss C. Smith, and I would like to thank the folks at the Beinecke Library at Yale for getting me access to view those in that collection. Now, I should note that unfortunately, back in the early 2000s, after Peter’s death, when that wonderfully searchable online version of the 1880 census was released, the photos by Miss C. Smith got mistakenly refiled under that phantom “Miss Catherine Smith”, who appears in the 1880 census. But as we saw, she turns out to be a little bit of a red herring. But at the moment, if you should happen to be at Yale looking for the Miss C. Smith photos, you’ll find them in box 306, filed under Miss Catherine Smith. Now, on the website, I’ll be including some examples of Miss C. Smith’s photos. Really, at any given moment, I think you can look on eBay and see at least one or two of the Miss C. Smith photos for sale. I have several, as I said Peter Palmquist had collected a bunch, and the Center for Lowell History has a bunch. So I’m going to be including some examples from all of those collections on the website. As always, you’ll find those episode notes at p3photographers.net. That’s letter “p”, number “3”, photographers “dot” net. Or drop me a line, at podcast “at” p3photographers.net. Support for this project is provided by listeners like you. Visit my website at p3photographers.net for ideas on how you, too, can become a supporter of the project.